Background & Aim :Single Incision Laparoscopic Surgery (SILS) is the next big thing happening in the world of Minimally Invasive Surgery. The study aims to address various issues involved in SILS including spectrum of procedures, technical difficulties, benefits and limitations. Materials and Methods: From July 2008 to August 2010, we performed 88 single incision surgeries. There were 60 females and 28 males with mean age of 26.5 years. All patients were subjected to Institutional Review Board approval and informed consent obtained from the patients. Patients with previous intra abdominal surgeries, medical co-morbidities and ASA grade more than II were excluded from performing SILS. 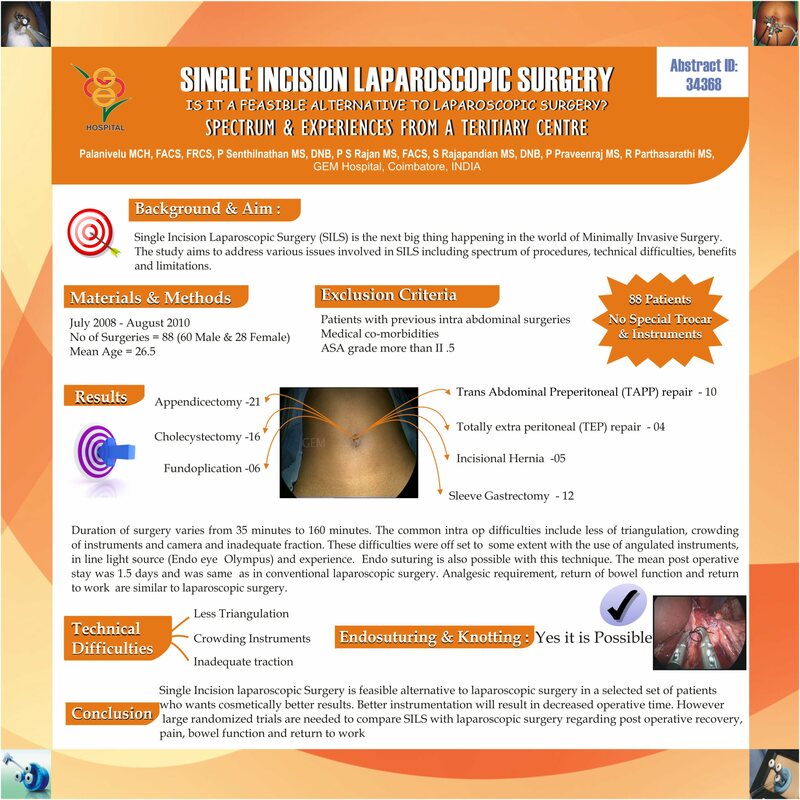 We used conventional laparoscopic – instruments with out special trocars in 40 patients and angulated instruments with special trocars in 20 patients. Results: The spectrum includes Cholecystectomy (n-16) Appendectomy (n-21) (n-14) Trans Abdominal Preperitoneal (TAPP) repair (n-10) ,totally extra peritoneal (TEP) repair (n-4) for Inguinal Hernia, Incisional Hernia repair (n-5), Sleeve Gastrectomy (n-12) and fundaplication (n-6). Duration of surgery varies from 35 minutes to 160 minutes. The common intra op difficulties include less of triangulation, crowding of instruments and camera and inadequate fraction. These difficulties were off set to some extent with the use of angulated instruments, in line light source (Endo eye – Olympus) and experience. Endo suturing is also possible with this technique. The mean post operative stay was 1.5 days and was same as in conventional laparoscopic surgery. Analgesic requirement, return of bowel function and return to work are similar to laparoscopic surgery. All patients were revived after 1 month and patient satisfaction were recorded using grading scale and 90% were satisfied with single scars. Conclusions: Single Incision laparoscopic Surgery is feasible alternative to laparoscopic surgery in a selected set of patients who wants cosmetically better results. Better instrumentation will result in decreased operative time. However large randomized trials are needed to compare SILS with laparoscopic surgery regarding post operative recovery, pain, bowel function and return to work.